Loch Maree in the region of Wester Ross in the North West Highlands is the fourth largest freshwater loch in Scotland, being some 12 miles long and a maximum width of about 2.5 miles. Arguably it’s also one of the prettiest lochs too, playing host to over sixty islands both large and small. 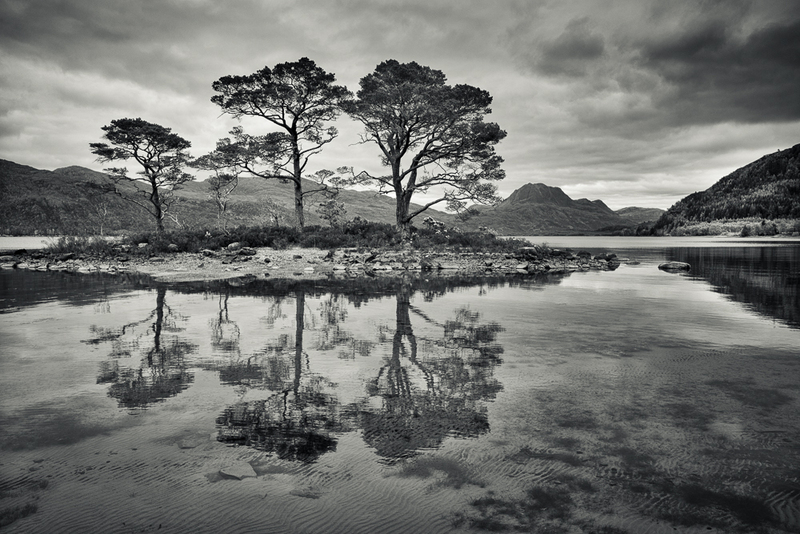 Some of the Scots pine trees on these islands are estimated to be over 350 years old. This particular image was taken from the shore near Slattadale forest and in the far distance the mountain of Slioch is clearly visible. I did have to wait some time for the wind to drop and the ripples in the water to subside, to capture the reflections at their best; but if you have to watch and wait, then it’s no great hardship in such a beautiful location. Thanks for commenting. The trees, their reflection and the mountains in the distance all came together very well. A shot that had to be taken. Certainly worth the wait for the reflection Alan, a beautifully tranquil image. Looking forward to seeing more after the glimpse I had this morning. Thanks John. Processed a few more this afternoon, so plan to post these and others soon. This is beautiful. I didn’t realise the trees on those islands were so old, either. Thanks very much. Kind of you to comment.